Stormboard is an online collaboration tool that has a Kanban feel to it. You can write out sticky notes, collaborate with others around the world, and vote (and chat) on the ideas. It's very streamlined and easy to pick up. Want to see the review from last year? I did a review of Stormboard last year as part of the Visual Mapping Review Series 2014. You can check it out to see more about the voting, commenting, and other aspects of Stormboard. Removed the sidebars – Getting rid of the sidebar gives you more room on your screen to work with your ideas. Double Click to add ideas – To add ideas, all you need to do is double click (or double tap on a tablet or touchscreen) and a new dialog will pop up for you to create your sticky. 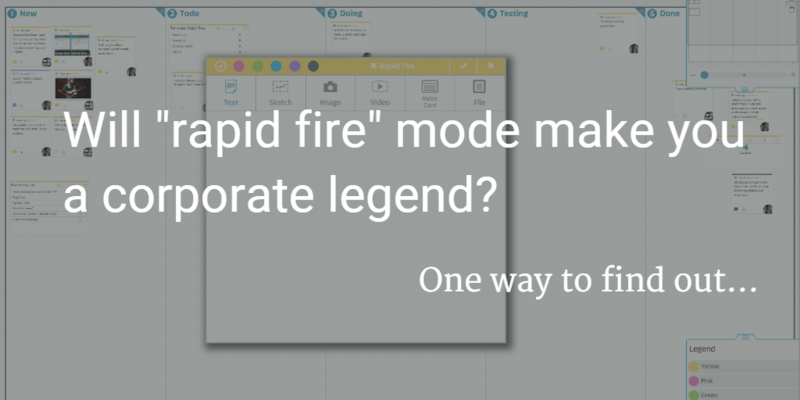 If you want to quickly create multiple ideas, click the rapid fire button and after you add an idea the dialog will pop back up and you can create another one. One drive and Box Integration – Add ideas from your One Drive or Box accounts and have them embedded straight into your storm. Document Viewer – Now when you upload a PDF, Microsoft Word, Microsoft Excel or Microsoft PowerPoint document into Stormboard (via drag and drop or from Box or One Drive) you’ll be able to preview those documents right inside Stormboard. Sketching on top of images – Draw on top of images that you’ve uploaded! This is great for working together on screen mockups or photo edits or logo designs. Insert videos – Search Youtube from right inside Stormboard and with one click, add that video to your storm. You can still paste a private video link in the search box and it will add it too! Template picker – This template picker makes it easy to search for a template and preview it. Additionally all templates are now resizable! And with an awesome bit of magic, your ideas will stay in the same sections when you change the size of your template! Storm switcher – The new storm switcher makes it super easy to switch between storms. the list is sorted by the last active storm so it’s easy to flip between projects you’re working on. What's your favourite new Stormboard feature?